Ottawa, ON, October 14, 2016 – According to statistics released today by The Canadian Real Estate Association (CREA), national home sales edged slightly higher in September 2016 compared to August. National home sales edged up 0.8% from August to September. Actual (not seasonally adjusted) activity in September rose 4.2% year-over-year (y-o-y). The number of newly listed homes ticked up 0.5% from August to September. The MLS® Home Price Index (HPI) in September was up 14.4% y-o-y. The national average sale price climbed 9.5% y-o-y. The number of homes trading hands via Canadian MLS® Systems rose 0.8 percent month-over-month in September 2016. 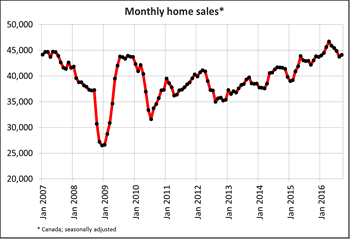 Having eased in each of the previous four months, national home sales are 5.6 percent below the record set in April 2016. The number of markets was evenly split between those where activity rose on a month-over-month basis and those where it declined. Continuing recent trends, sales climbed further in and around the Greater Toronto Area (GTA) and fell further in and around the Lower Mainland of British Columbia. As previously reported, Greater Vancouver and Fraser Valley home sales had retreated sharply for five months straight before the new foreign buyers’ tax in Metro Vancouver was announced in August. Activity has returned to more normal levels after having peaked at the start of this year. Indeed, most of the decline since the April peak in national sales reflects the rapid drop in activity in and around B.C.’s Lower Mainland. 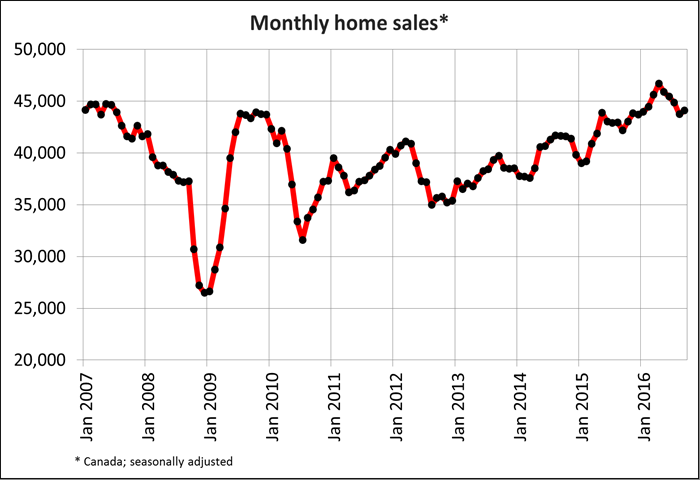 Actual (not seasonally adjusted) sales activity was up 4.2 percent y-o-y in September 2016. Transactions were up from year-ago levels in almost two-thirds of all Canadian markets. Led by the GTA and environs, the increase was held in check by the drop in activity in B.C.’s Lower Mainland. The number of newly listed homes inched up by 0.5 percent in September 2016 compared to August. As with sales activity, the number of markets where new listings were up on a month-over-month basis and those where they fell was evenly split. With inventory in acutely short supply, the rise in new listings supported higher sales activity in the GTA and the national total. With sales and new listings having risen by similar magnitudes, the national sales-to-new listings ratio (62.1 percent) was little changed from August (61.9 percent) and remains well off the peak reached in May (65.3 percent). The ratio was above 60 percent in almost half of all local housing markets in September, virtually all of which continue to be located in British Columbia, in and around the Greater Toronto Area and across Southwestern Ontario. However, the ratio has moved out of sellers’ market territory and into the mid-50 percent range in Greater Vancouver and the Fraser Valley. There were 4.7 months of inventory on a national basis at the end of September 2016. The measure has remained virtually unchanged since April, with fewer sales in the Lower Mainland counterbalanced by a shrinking supply of listings in and around the GTA. The tight balance between housing supply and demand in Ontario’s Greater Golden Horseshoe region is without precedent (including the GTA, Hamilton-Burlington, Oakville-Milton, Guelph, Kitchener-Waterloo, Cambridge, Brantford, the Niagara Region, Barrie and nearby cottage country). The number of months of inventory ranges between one and two months in Greater Golden Horseshoe housing markets and is less than one month inside the GTA. 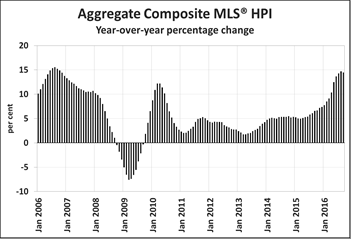 The Aggregate Composite MLS® HPI rose by 14.4 percent y-o-y in September 2016. Down from 14.7 percent in August this was the first deceleration since March 2015. On a y-o-y basis, price growth throttled back for one-storey single family homes and apartment units and held steady for two-storey single family homes and townhouse/row units. Townhouse/row unit and two-storey single family home posted the biggest y-o-y increases in September 2016 (16.4 percent and 16.3 percent respectively). Price increases were close behind for one-storey single family homes (14.0 percent) and apartment units (11.1 percent). While prices in 9 of the 11 markets tracked by the MLS® HPI posted y-o-y gains in September, increases continue to vary widely among housing markets. Greater Vancouver (+28. 2 percent) and the Fraser Valley (+35.0 percent) posted the largest y-o-y gains by a wide margin. However, single family home prices in both of these markets dropped from the month before, marking the first significant decline since late 2012. Double-digit y-o-y percentage price gains were also registered in Greater Toronto (+18.0 percent), Victoria (+19.4 percent) and Vancouver Island (+13.9 percent). By contrast, prices were down -4.1 percent y-o-y in Calgary. Although home prices there have held steady since May, they have remained below year-ago levels since August 2015 and are down 4.6 percent from the peak reached in January 2015. Home prices also edged lower by 1.2 percent y-o-y in Saskatoon. Home prices in Saskatoon have also held below year-ago levels since August 2015. Meanwhile, home prices posted additional y-o-y gains in Regina (+4.9 percent), Greater Moncton (+4.2 percent), Ottawa (+2.7 percent) and Greater Montreal (+2.7 percent). The actual (not seasonally adjusted) national average price for homes sold in September 2016 was up 9.5 percent y-o-y to $474,590. That said, Greater Vancouver’s share of national sales activity has diminished considerably of late, resulting in it having less upward influence on the national average price. Even so, the average price is reduced by more than $100,000 to $358,884 if Greater Vancouver and Greater Toronto sales are excluded from calculations.